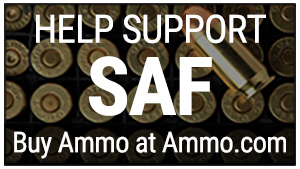 Gun Appreciation Day, a project supported by various conservative and gun rights organizations, was a “phenomenal success,” according to Alan Gottlieb, executive vice president of the Second Amendment Foundation, one of the original sponsors. He estimated that “more than a million citizens” attended gun rights rallies at state capitols across the country, and other locations. In addition, the estimate includes the hundreds of thousands who attended gun shows, visited gun shops or went to a shooting range or went hunting. “These were patriotic, law-abiding people exercising their First Amendment rights to protect their Second Amendment rights,” Gottlieb stated. Huge crowds gathered on capitol campuses from New England to Hawaii. 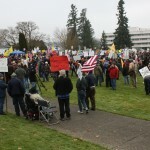 In Olympia, Wash., the crowd size was estimated at 2,000-2,500, and many of those in attendance were visibly armed with either handguns or semiautomatic rifles carried peaceably, typically with muzzles down. Many others carried signs criticizing government gun controls or promoting Second Amendment freedoms. Gottlieb said the Gun Appreciation Day rallies were designed to educate people that armed citizens can gather peaceably, and that their firearms are not responsible for violent crime. In Albany, NY, Assemblyman Steven McLaughlin blasted the recently-passed gun control law banning so-called “assault weapons” an “abuse of power” by Gov. Andrew Cuomo. 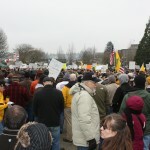 More than 2,000 gun owners turned out for that rally. Depending upon whose estimates one believes, there were crowds ranging from the hundreds to the thousands at rallies in Colorado, Connecticut, Maine, Minnesota, Missouri, New Mexico, Kansas, Michigan, Wisconsin, North Carolina, Ohio and Montana. Gun shows held over the weekend saw especially large crowds on Gun Appreciation Day, and several people interviewed in the waiting line, which stretched part of the way around the fairgrounds in Puyallup, Wash., said they attended because of the GAD event. Many came also to join the Washington Arms Collectors, which sponsors the monthly gun show. The event came under blistering partisan criticism because it fell on Jan. 19, two days before President Barack Obama’s second inauguration and the celebration of Martin Luther King Day. 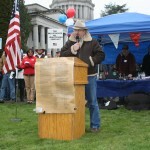 But crowds at the gun shows and gun rights rallies attracted a diverse audience of gun owners. Gottlieb also said the turnout for Gun Appreciation Day events served as something of a warning to gun grabbing politicians.